Electric griddles from Presto are designed specifically for a serious home cook and light commercial kitchen usage. Presto 07046 Tilt ‘n Drain Big Griddle Cool-Touch Electric Griddle represents the best of both old and new generations. 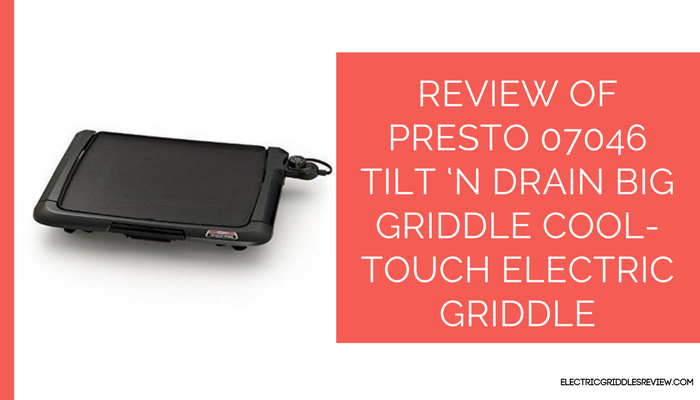 It is made of ‘next generation’ construction materials and maintains ‘old school’ design aesthetic, hence this Presto electric griddle is the best bang for your buck. 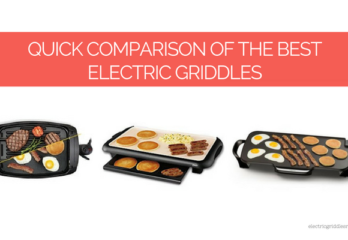 Though it is not the largest electric griddle in the market, it is a quite big griddle as its name suggests. It offers a huge cooking surface of 18.5”x15” and is one of the largest griddles available. The body of the griddle is made of cast aluminum, which is light, quite rigid and good for even heating. 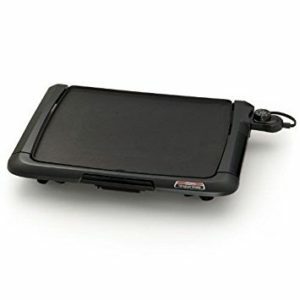 Like many other griddles, this model of Presto griddle also has the nonstick coating on its cooking surface. The cooking surface has a premium nonstick coating that reduces the amount of oil needed and making the food healthier. Safety measures need to be taken not to scratch the surface and metal instruments should not be used as they scratch and peel out the nonstick coating. The other feature it includes is the tilt n drain functionality as its name says. This feature allows you to tilt the griddle in order to drain the unwanted grease and oil while cooking or simply use the appliance on the level position depending on what you are cooking. This tilt n drain feature can be handy in various situations but it can also be a problem if you are not careful while moving the whole unit. All you need to do is pull the handle out to create a tilt and push it back in to create a level-cooking surface. This model has a cool touch base, which offers the safe maneuvering while cooking on it. But still, like any other electrical appliance, it is important to read the manual that comes with the product and follow the given instructions. The non-stick coating on the cooking surface prevents the food from sticking and makes the cleaning process easier. Its heating control is detachable and after its removal, the griddle is fully submersible in warm, soapy water for cleaning. This model is also dishwasher safe. A control master heat control maintains proper cooking temperature automatically. 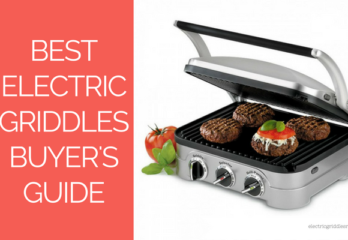 It can handle full 1500 watts of power and cooks your food to perfection in very less time. Nonetheless, some users have complained about its uneven heating when needed. You can make some really good eggs, fluffy pancakes, and delicious French toasts but this unit can also be used to prepare a variety of other breakfast meals, lunches, and dinners. This Presto cool touch electric griddle features built-in backstop ledge that offers easy food handling. As much as it is easy to clean, it is not so easy to store it. Because of its large size, it takes much space on both kitchen counter and cabinet. If you don’t have enough space to store it, don’t think of buying this model. It’s handy to cook food for the crowd but on the other hand, its storage can be a problem. With very few drawbacks, this griddle has impressed a lot of its users and is recommended the product to own. If you are ready to make the efforts for its cleaning, you can get this for your kitchen. This really saves your time and energy while preparing lots of food for your family and guests.